A parliamentary report of 1777 recorded local workhouses in operation at Newcastle All Saints (for up to 100 inmates), Newcastle St John (26), Elswick in St Johns (40), Westgate in St Johns (12), and Byker (10). 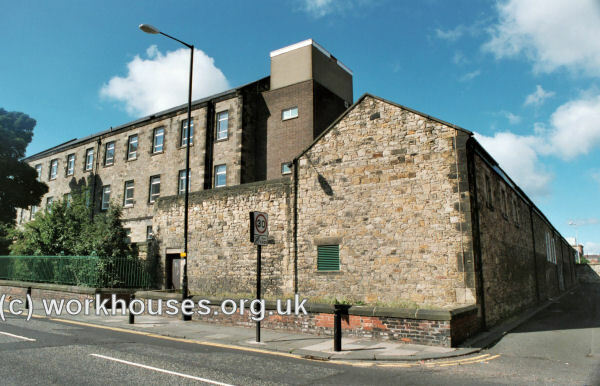 An account in 1831 by Thomas Oliver described four parish workhouses in Newcastle. St Nicholas Poor House adjoining the Long Stairs opened there October 17th, 1803. The premises belong to the parish, and though in a crowded district, has a fine view to the south. The present number of inmates is 36, but the accommodations are scarcely adequate in affording a comfortable asylum to so many objects of charity. Each pauper is calculated to cost 3s. 9¼d. per week. St John's Poor House in Bath lane, adjoining the Lunatic Asylum : the present number of inmates is about 35 : the children are sent to the Sunday School : each pauper costs 3s. 1d. per week for food alone, medicines to the sick are dispensed by the apothecary to the Infirmary : those who use tobacco are allowed half an ounce per week. St Andrew's Poor House which was considerably enlarged and altered in 1810 and 1817 : it contains at present 56 inmates : the average expense of their food is calculated at 4s. per head weekly : the children of a proper age are sent to school, and the girls when usefully employed in the house are taught writing and accounts by a master in the evenings : everyone receives a pecuniary recompense for work done : the sick have medicines administered to them and are allowed beer, wine and spirits when ordered. All Saints Poor House occupies part of the site of the Augustine Convent. It was formerly used as a General Hospital for the poor of Newcastle. The present number of paupers in the house is 62. Each costs about 4s. 10½d. per week for meat and clothes. County of the Town of Newcastle: All Saints (9), Byker (3), Elswick, Heaton, Jessmond, St Andrew's (6), St John's (5), St Nicholas (4), Westgate (2). Northumberland: Benwell, Fenham. The population falling within the union at the 1831 census had been 54,991 with parishes and townships ranging in size from Fenham (population 100 each) to Newcastle All Saints (17,063). The average annual poor-rate expenditure for the period 1834-36 had been £15,049 or 5s.6d per head of the population. In 1914, following and enlargement of the city's boundaries, the union was reconstituted as the Newcastle-upon-Tyne poor law parish. 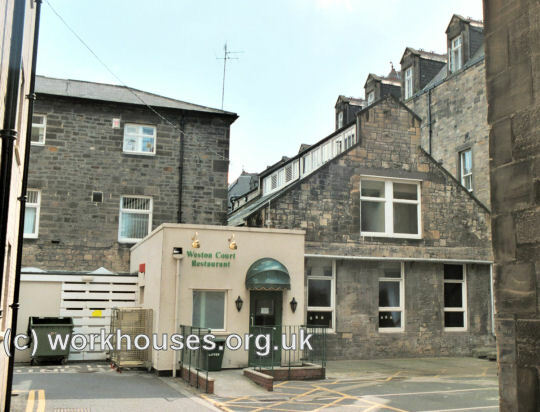 In 1839, the Newcastle-upon-Tyne Board of Guardians decided to replace the existing workhouses with a new purpose-built one at a site to the west of the city at the top of Westgate Hill. The first workhouse buildings were erected at the south-east corner of the site at the junction of Westgate Road and Brighton Grove. Included were an administration block, dining-hall, laundry, bakehouse, workshops, school, sick wards, lying-in ward and imbeciles' ward. Males were placed at the western side of the workhouse and females at the east. In September 1868, work started on a new infirmary located at the west of the site. A foundation stone was laid on 9th December by Mr Milvain, vice-chairman of the Board of Guardians. The building's construction cost £16,302 and it was officially opened on 7th December, 1870, by the Board's chairman, Mr Thomas Ridley. The infirmary was two storeys high and arranged in the shape of a U opening onto Westgate Road at the south and enclosing a quadrangle of grass. There were eight main wards plus three semi-basement wards on the north and east sides where the slope of the land made the foundations lower. Male wards were placed at the west and female at the east. A separate children's block was erected between the workhouse and the 1868 infirmary of the workhouse. The boys' school, dayroom, playground and dormitories were located in the northern part of the building, while girls and infants were at the south. At the north-east of the school, a separate block contained the children's swimming bath. 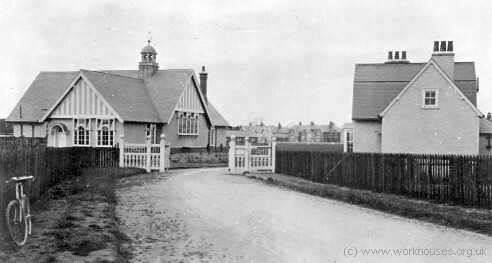 In 1902, the children were removed to the union's new cottage homes at Ponteland (see below) and the building then used for the workhouse's aged and infirm inmates. The dining-room was converted into a chapel. 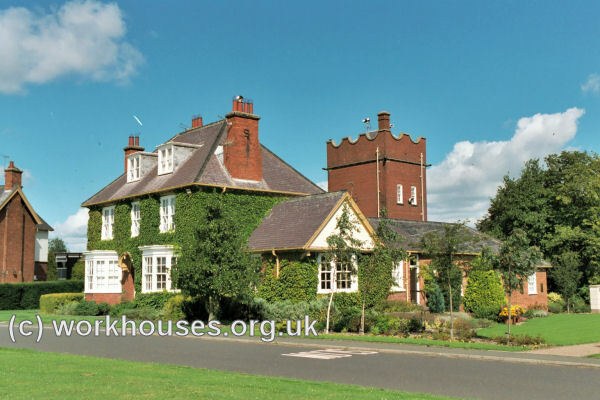 The [workhouse] was one lately established in the vicinity of Newcastle, consisting of a cluster of neat buildings laid out in the form of courts and wings, and surrounded, like the one just described, by a shrubbery and garden ground. It was Sunday, and the inmates had just finished dinner — which, for each person, consisted of five ounces of boiled beef with potatoes in proportion — reminding me of the very good kind of dinner for which one pays about a shilling at the famous boiled beef-house in the Old Bailey. Adjourning from the dining-hall to a neighbouring apartment, I found a knot of old men in that contented looking humour which usually distinguishes the countenance of the Englishman immediately after the great central meal of the day, all sitting cozily on plain wooden sofas round a capital fire, and really, to be in a "Bastile," wonderfully jocular and happy. In 1882, the small entrance lodge was replaced by an imposing three-storey building with a central archway. The building contained waiting rooms and receiving wards on the ground floor, with a three-roomed residence above and store rooms on the top floor. The allocation of the buildings in 1902 are shown on the plan below. In 1902, a separate Itch and Venereal Ward was erected at the west of the workhouse site. This was a two-storey building with about 50 beds. 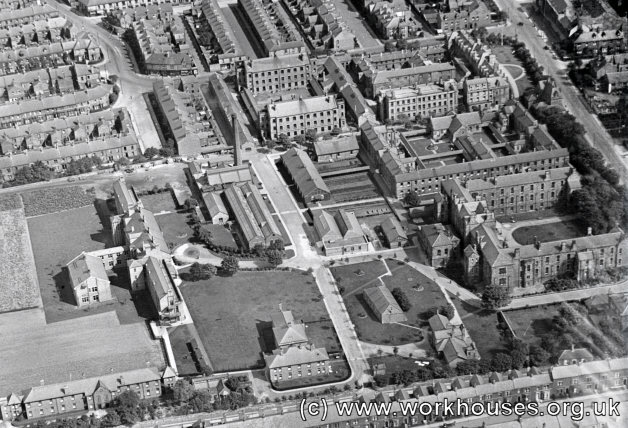 Newcastle-upon-Tyne workhouse aerial view from the north-west, 1920s. The first vagrants' ward was at the west of the site just to the north-west of the hospital. This later became an isolation ward. More extensive vagrant's ward were erected further to the north, along the road to St Nicholas cemetery, including a stone-breaking yard. Aerial view of vagrants' ward (left) from the north-west, 1920s. Newcastle-upon-Tyne entrance from the south-west, 2001. Newcastle-upon-Tyne administration block from the south-east, 2001. Newcastle-upon-Tyne dining hall, kitchens, and rear of administration block from the west, 2001. Newcastle-upon-Tyne sewing room and bakehouse from the south-east, 2001. Newcastle-upon-Tyne male ward block and workshops from the north-east, 2001. In the First World War, the military authorities took over all the workhouse buildings, and some of the hospital for the treatment of venereal diseases in soldiers. In 1939, at the start of World War Two, the western part of the entrance building and the archway were taken down in case of bombing. In 1921 the medical facilities at the workhouse were placed under a separate administration and given the name Wingrove Hospital. In 1930, after ontrol of the site passed to the local council, it was renamed Newcastle General Hospital. 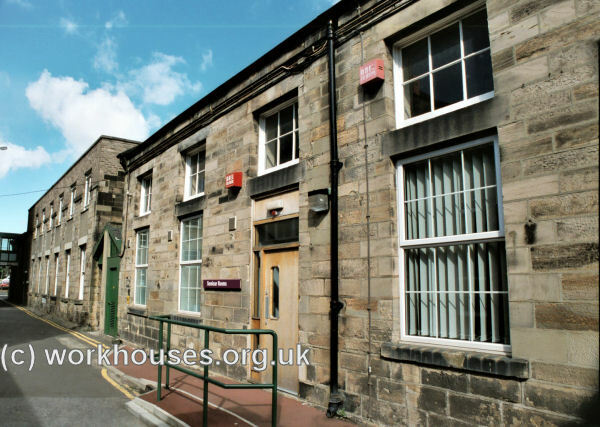 At the same time, the Public Assistance facilities, based in the original workhouse section of the site, became Elswick Grange Institution. In 1948, the whole site was brought together, still under the name of Newcastle General. 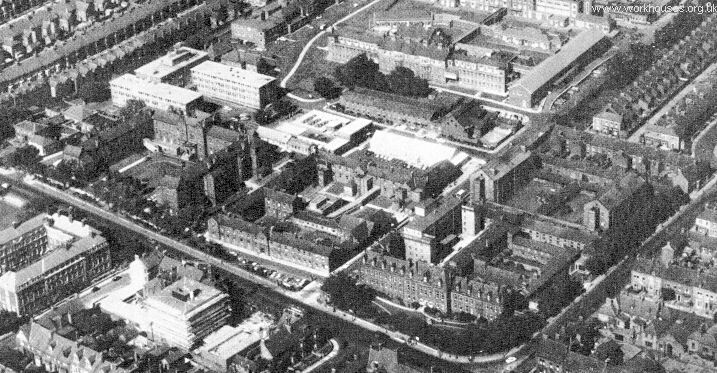 Newcastle-upon-Tyne General Hospital aerial view, 1960s. 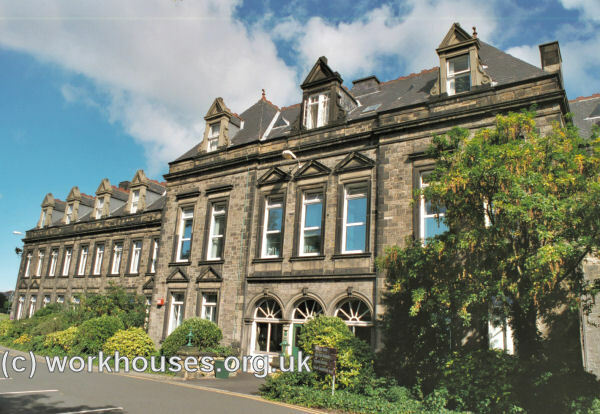 In addition to the main workhouse, the union had an auxiliary workhouse workhouse in an old building on the north bank of the Tyne in Newcastle. It accommodated 60 and was used for temporary relief. Half the inmates were tramps. Of the remainder, some were detained on account of their parents being in the public fever hospital, and some because they had been deserted by their husbands or parents. There were two yards, three rooms and a day room for men, three for women, and two tramp rooms. 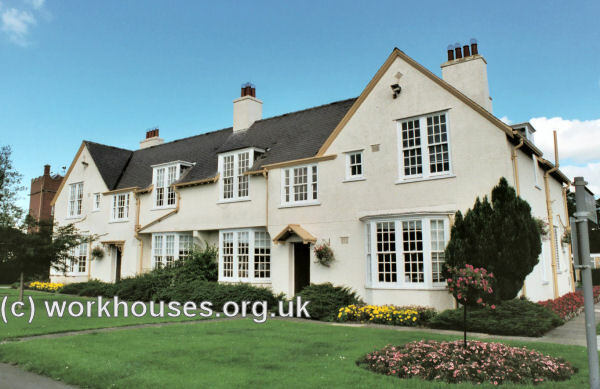 In 1901, the Union erected cottage homes on a 70-acre rural site at Ponteland for the accommodation of 300 pauper children away from the workhouse. Each cottage block was supervised by a "house-father" or "house-mother" and accommodated between thirty and forty children. The homes, which were extended in 1913, also included a school, infirmary, and workshops including a blacksmith's shop. The construction of the homes was the subject of a this report in The Builder in June 1901. COTTAGE HOMES, PONTELAND, NEWCASTLE-ON-TYNE.—Cottage homes are being erected at Ponteland by the Newcastle Board of Guardians for the accommodation of destitute children. About seventy acres of ground have been secured. Entering from the Kirkley-road by a new thoroughfare that is being constructed across the fields, the first building will be the superintendent's house, which will also contain the stores and offices. 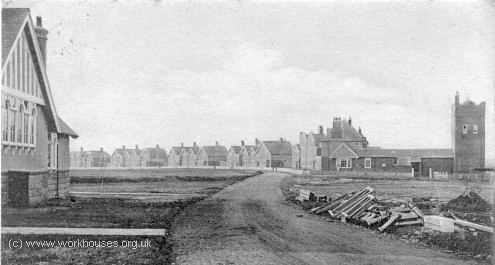 Four double blocks of cottages will be constructed and one half-block, the latter being intended at first as an isolation hospital in the event of any outbreak of disease amongst the children : but in the event of more accommodation being required later on it can he converted into a home and another building erected as a hospital. It is also part of the scheme to erect a workshop for the teaching of trades, such as plumber, joiner, shoemaker, &c., the instruction being given by qualified tradesmen who will be appointed under the title of foster fathers to each block. The intention is to appoint respectable married tradesmen to these positions. Then there are stables and out-offices to be used in connection with the working, of the land, part of which will be laid out as kitchen gardens, part as a plantation, and part as arable land. A plentiful supply of spring water has been obtained by boring. The buildings will be of red brick with slated roofs. The larger block of cottages will accommodate forty children, and the three smaller blocks thirty each. The architects are Messrs. Oliver, Leeson, & Wood, and the builder is Mr. Henderson, of Ponteland. Mr. Humphrey Atkinson has been appointed clerk of the works. Cottage homes under construction, c.1902. Each cottage block was designed slightly differently to make it easier for new children to find their own one. 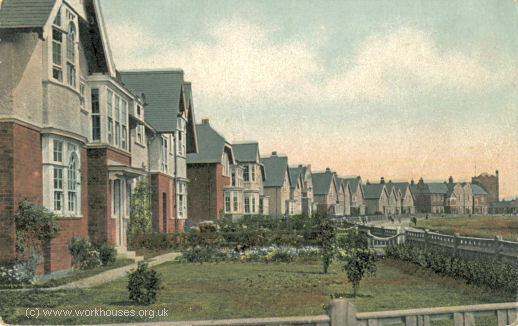 Newcastle-upon-Tyne cottage homes from the west, c.1905. Newcastle-upon-Tyne cottage homes from the east, 2001. A Superintendent's house was placed to the north of the site entrance. Newcastle-upon-Tyne cottage homes Superintendent's house and stores from the south-east, 2001. 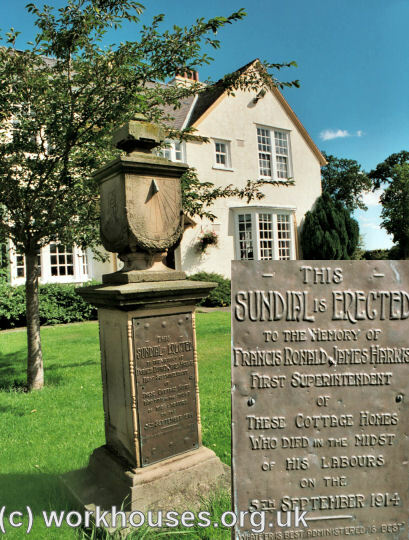 A sundial memorial was erected for the homes' first superintendent, Francis Ronald James Harris. Newcastle-upon-Tyne cottage homes Harris memorial, 2001. The T-shaped school block stood at the south of the entrance road. 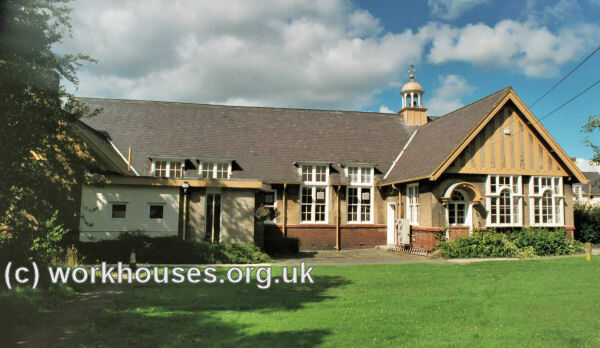 Cottage homes school block from the east, 2001. 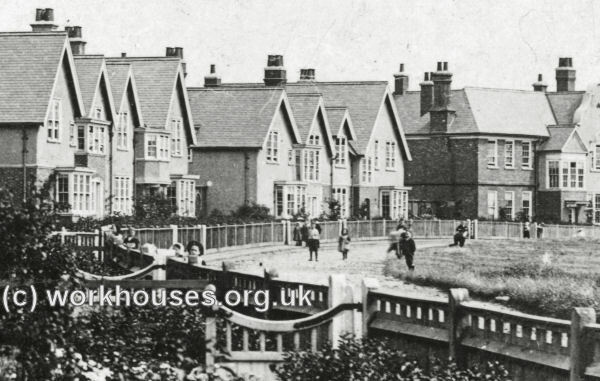 The Cottage Homes were a series of large, well-built houses round a very large oval of grass. They also included a school for the younger children (infants?). The Headmistress was Miss Heron who was followed by Mrs. Alec Purves. There -was also a laundry, and a cobbler's shop. This latter was run by Mr. Bell. Mr. & Mrs. Bell were house parents, with about ten children to a house. One of their boys, George Russell, won a scholarship to Gosforth Secondary School (later Grammar school) which he left in about 1926 and went to college to train as a teacher, becoming a Headmaster. The Bells treated him as their own, George even had his own room. Mrs. Bell retired to a house up the West Road, where she died during the Second World War. Older children attended schools in Ponteland, walking down. They also came to the village to Sunday school. At the Methodist Chapel where I was a Sunday School teacher, if the children from the Homes were unable to attend, Sunday school could be cancelled. One little boy in my class used to enjoy stroking my leg, liking the feel of silk stockings! The Master and Mistress of the Cottage Homes, Mr. & Mrs. Frank Harris, were both musical and trained the children for an excellent annual concert. Among the names I remember are Ethel Robertson who worked in the laundry, Billy Abbie who became a cobbler and married a girl from the homes, and Sarah Lye who passed the exam and went to Gosforth Secondary school with me from 1926-31. A 'Cottager' school friend of my younger brother was Ernie Walton who once hid overnight in Mawson, Swan and Morgan, an up-market shop in Newcastle, in the hope that he wouldn't be noticed next morning when he tried to walk out carrying expensive luggage, full of goodies no doubt. In the early days, the clothes of the children were very severe. The boys wore grey suits and rubber collars on their shirts. Their hair was cropped very close.All the clothes were made at the Homes. The sewing lady, Lydia Turk, married in middle age and became Mrs. John Thompson. Later, things became more relaxed and the children had bought clothes. As well as the Cottage Homes, which were a couple of miles up the North Road from Ponteland, there was a house called 'Louisville', run by the Board of Guardians. This was a large house to the side of the Workhouse and housed the babies and toddlers. 1 remember seeing them playing in the yard at the front of the house. Mr.& Mrs. Halliday were Master and Matron at the Workhouse and were succeeded by their son. 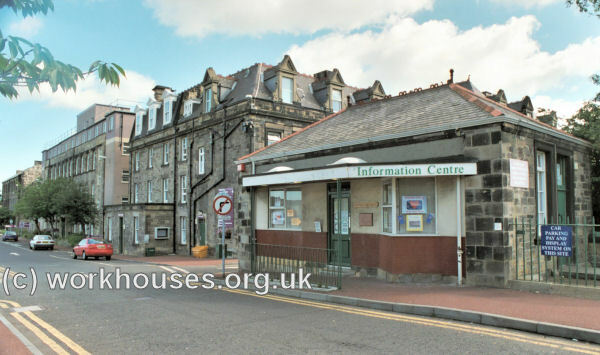 During the war, it became a hospital for the aged from Newcastle and those in long term care. The former cottage homes site is now the headquarters of the Northumbria Police. In around 1913, the Newcastle Union opened another cottage home at Myrtle Cottage, Bentinck Road, Newcastle. The Matron in 1914 was Miss Julia Ninnis. The property, later known as Cedar Lodge, no longer exists. Tyne and Wear Archives, Discovery Museum, Blandford Square, Newcastle upon Tyne NE1 4JA. Holdings include: Apprenticeship indentures (1808-1927); Births register (1840-1923); Register of lunatics (1865-1909); Children's emigration papers (1922-29); Register of infants received for reward (1902-36); etc. The History of Newcastle General Hospital by George Hurrell and George P Harlan (1966).